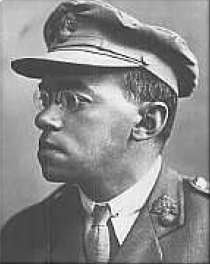 Ze’ev Jabotinsky (1880-1940) Famous for his instrumental role in the establishment of a Jewish state, Jabotinsky first gained fame as a journalist. In Russia, he formed the Jewish Self-Defense Organization to arm Jews to fight back the pogroms, saying it is “better to have a gun and not need it, than to need it and not have it!” Later, he formed the Jewish Legion for the British Army, fighting in several wars, for which he was awarded the Order of the British Empire. A staunch Zionist and freedom fighter, he worked tirelessly for Israel, at one point being arrested and given a 15-year prison term. He also wrote nearly a dozen books. Amazingly, sensing what he called an impending “super-pogrom”, in 1936 Jabotinsky set up an evacuation plan to bring every single Jew from Poland, Hungary and Romania to Israel. All three governments eagerly agreed to the plan. Unfortunately, it was not popular among the Polish Jews. Ultimately, the British vetoed the plan and prevented it from materializing. Today in Israel, there are more streets and parks named after him than any other figure. This entry was posted in Law, Politics & Military, Writers & Thinkers and tagged British Empire, Hungary, Israel, jabotinsky, jewish legion, Jewish Self-Defense Organization, Poland, Romania, Russian Jews, Ukrainian Jews, Zionism, Zionist on March 24, 2011 by Jew of the Week.